With FABTECH 2017 ending and business getting back to normal we invite you to visit our manufacturing facility and get a feel for what Bancroft Engineering can do for you. Everyone who visits our facility gets a unique opportunity to see the production floor firsthand and experience the many benefits of our engineered systems. 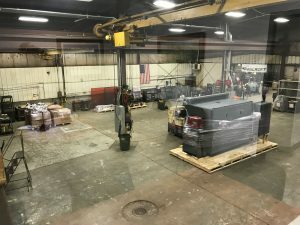 Our 15,000-square foot facility is equipped with the latest in automated welding technology and a team of engineers, equipment builders, and welding experts. There is always someone ready to show new visitors around our facility, explain equipment, and answer any questions you have. If you are in the market for a standard Welda-Round or Weld-Lathe one will always be on display and running for you to explore. 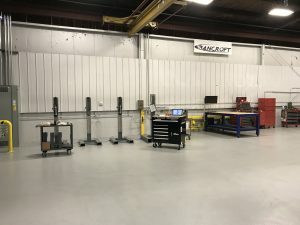 If it’s a seamer, custom, or robotic system you’re in search of; you can bet that something is under construction attesting to our quality and innovation. Don’t have time to travel to Waukesha, WI? Visit our website to see our capabilities and tell us your welding needs! One of our sales engineers will be happy to direct you to the right equipment that will help you reach your manufacturing goals and expedite a return on your investment. Contact us at sales@bancrofteng.com to discuss a project or schedule a plant tour today. We’d love to hear from you! Comment on "Our Doors are Open"
Looks Great! I will have to stop in some time and check it out.